The primary goal of my work has been to memorialize the Holocaust. 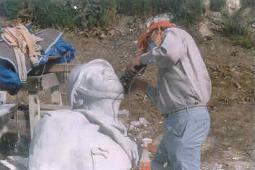 I have been a marble sculptor for 40 years. I have studied at the Art Institute of Southern California (Laguna Beach) and at the Art Students League (New York), but I am primarily self-taught. I carve directly in the stone, unlike the vast majority of current-day artists who first model in clay and then have someone else copy their model into marble. My philosophy has been to do what only art can do, and that is to selectively re-create reality. Please feel free to forward this website to your friends and associates. Also, please bookmark this website for future reference.